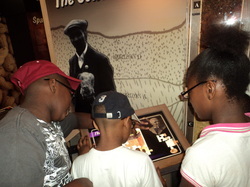 This is the Dr. George Washington Carver Museum, located on the campus of Tuskegee University, in Alabama. It is part of the Tuskegee Institute National Historic Site. Dr. Carver worked and taught classes here for over 50 years of his incredible life. A collection of quotes from Dr. George Washington Carver. A Short Film on Dr. Carver. This is a short Social Studies film on Carver that is fun to watch. "From inauspicious and dramatic beginnings, George Washington Carver became one of the nation's greatest educators and agricultural researchers." This is a short biography of Dr. Carver, from Iowa State University. Learn about the life of Dr. George Washington Carver and his many accomplishments. This is an article on the Inventions of Dr. George Washington Carver. These are Agriculture Bulletins written by Dr. George Washington Carver, while at Tuskegee. He wrote 44 Bulletins. To see a complete list of his Bulletins, click here. These are a few of Dr. George Washington Carver's recipes, developed at Tuskegee, Alabama.